Minicab drivers from London will be protesting at City Hall later this morning when the Transport for London non executive board is due to meet with the Mayor. This is the latest in a series of protests by the United Private Hire Drivers branch of the IWGB union as they aim to highlight the urgent need for the regulator to eradicate 'sweated labour' conditions in the publicly licensed trade.Drivers are demanding:Worker Rights. The union claims the Mayor must do more to make worker rights a condition of licensing for firms like Uber and Addison Lee and demand these and other firms obey all UK employment law. Uber and Addison Lee have both been found to be in violation of employment law by two separate Employment Tribunals.A fairer regulatory cost burden. The UPHD wants the Mayor to reduce the cost and regulatory burden on precarious workers and make licensed operator firms like Uber and Addison Lee pay their fair share. Recently, Transport for London announced a plan to make minicab drivers pay the congestion charge costing drivers an estimated £250 per month. This would mean an average Uber driver would need to work an extra 12 hours per week just to cover the extra costs. Trade union representation. The London Mayor has also been pushed by the union to instruct Transport for London to end discrimination which denies 114,000 mostly BME minicab drivers dedicated trade union representation while 23,000 mostly white British black cab drivers have the choice of five separate trade representative bodies. The UPHD also demand that far right influences within the current permitted stakeholder group be removed. Action against attacks on minicab drivers.According to a survey conducted by the UPHD 55% of minicab drivers have been assaulted while working and 83% have been victims of hate crime. 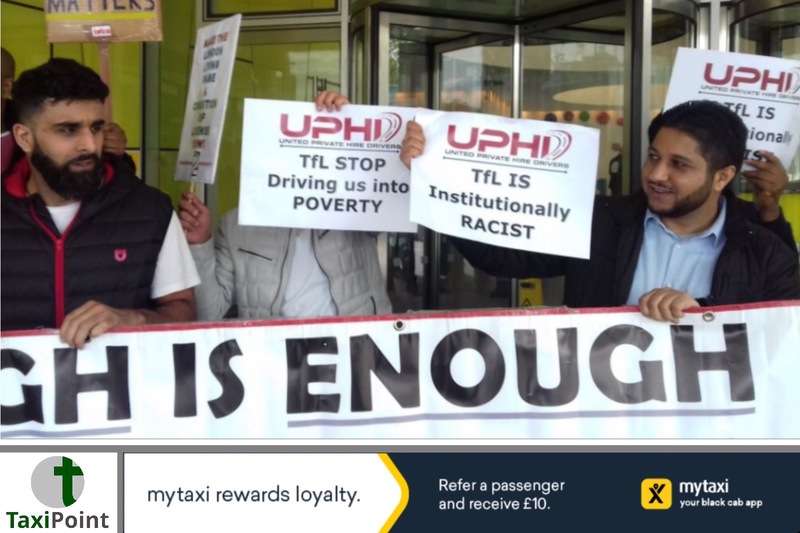 TfL are being urged to act together with the police to make sure private hire drivers are kept safe at work.A spokesperson for the union accuses TfL of being institutionally racist due to a lack of regard for exploitation and violence against a group of mostly BME workers together with their decision to place an unfair cost & regulatory burden on minicab drivers while denying them right of representation. Yaseen Aslam, Secretary of United Private Hire Drivers branch of the IWGB union and co lead claimant in Aslam & Farrar v Uber said:"It is time for the Mayor to stand up for precarious workers and to eradicate sweatshop conditions from the licensed trade in the capital once and for all. The Mayor must also bring an end the scourge of institutional racism at Transport for London."